Brisbane’s industry leaders are planning the Future Brisbane Campaign – “City of Dreams” (Courier-Mail 28th August). Columnist and adjunct professor at Curtin University Business School, Bernard Salt, and the Courier-Mail are holding a business lunch on September 1st. They will discuss the future of Brisbane. If we are to be a “booming population” = another 662,000 people by 2031 with an “unmatched 21st Century Lifestyle”, we will have to plan carefully, with an informed community, who are able to constructively participate in planning for a future Brisbane . We already have a 2031 Vision in to our City Plan. It seeks modern progress and also holds the “Clean Green Lifestyle” as a key objective. Brisbane’s liveability will be determined by the retention of this important environmental and social objective. The only reference to green space in the Courier-Mail promotion of “Future Brisbane” was from Jemima Dunn, Chief Executive Southbank Corp., who stated: “Green Space is going to be absolutely critical because we’re going to have higher density development than we’ve ever seen before, and people need to get out and experience the city, but they also need areas of sanctuary”. 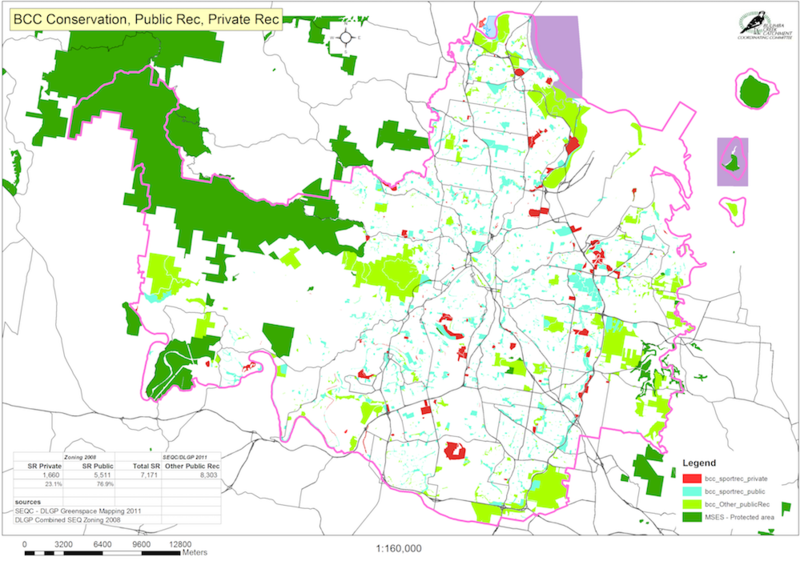 Compared to other Australian cities and overseas, Brisbane is not overly endowed with open space, with much of it in private hands. That makes greenspace even more critical to our city’s future. We do have some excellent nature reserves, natural areas, waterway corridors – all habitat for our wildlife who share our “sanctuaries”. We now have an immediate threat to our greenspace network from Council’s plan to amend City Plan – Aged Care Amendments. This aims to allow this development sector to be able to build facilities on privately-owned Sport and Recreation land. This will potentially allow the Aged Care developers to target sporting clubs, like struggling golf courses, bowling clubs, etc on Sport and Recreation land. Brisbane has 136,700ha but only 7,171ha or 5% of Sport & Recreation land; 77% of which is in public ownership and 23% in private ownership. This City Plan amendment could see much of our open spaces threatened by this type of development. Is Council going to target public Sport and Recreation lands also, through its own development arm, the City of Brisbane Development Corporation? Already the Pacific Golf Club at Carindale and Coorparoo Bowls Club are in line for proposals and many other financially struggling sporting clubs will come under scrutiny and pressure from developers. Brisbane City Council should explain to the community what this means for our open space lifestyle of Brisbane. It is a threat which will impact on the recreation opportunities, which will increase along with our population (662,000 more people by 2031). This will be a compound pressure on all Green Space as demands will increase, particularly from the recreation sector. Parklands and Conservation areas will then come under pressure. So will the future of native wildlife and plants (Biodiversity). Koalas and other wildlife are already under intense pressure. A future Brisbane must not lose the advantages of retaining its attraction of a Clean, Green City which we share equitably with nature. Our Natural Heritage must be part of Brisbane’s future. Council should re-assess this major change to its planning process. Aged Care development already has extremely generous incentives within the City Plan. – Your local State Member. Brisbane City Council, Future Brisbane. Above map is a little hard to read (the legend. So this is the colours you see . . .
Blue: Council owned Sport and Recreation lands = 77% (including waterway corridors.